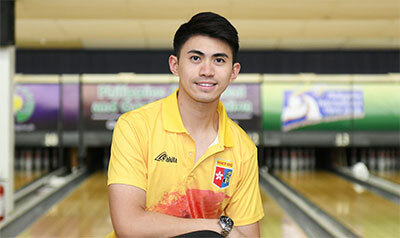 12th May, Manila: 2014 ABF Tour Indonesia champion, Mike Chan of Hong Kong won the Men's Open Round 1 finals by a narrow margin at the PBF 2nd Philippine International Open ahead of two Indian nationals, Shabbir Dhankot and Dhruv Sarda in second and third. Chan gor off the block with a brilliant 259, only to lead Sarda by a single pin. Two Filipinos, Aui Padawan and Ivan Malig shared third with 255 with Praise Gahol of Philippines and Dhankot also registering big games for fourth and fifth. Gahol added 235 in his second game to take over the lead while his compatriot, Padawan posted 224 to move into second spot as Chan managed only 205. The lead changed hands again when Padawan rolled a superb 258 to take over the running with Chan recovering with 236 to take second spot. The two Indians could not keep pace with the trio but was able to post decent games to stay as close as they could. Chan then blazed the lanes with 249 and 258 to to regain the lead and extending his lead over Padawan to 36 pins after the fifth game. Although Chan managed only 200 in his sixth game, all his closest opponents bowled lower than what he managed and allowing the Hong Kong national to extend his lead to 70 pins. Despite struggling on the drier lanes toward the end, Chan held on to win the round 1 with 1781. Dhankot stormed home with 233, 247 and 227 to clinch second spot with 1773, just 8 pins adrift while his team-mate, Sarda also ended strongly to claim third position with 1761. Kayle Abad of PBA-Nobleland and Gahol completed the top five with 1737 and 1723 respectively. Hassan Alshaikh of Saudi Arabia finished sixth with 1721 ahead of Raoul Miranda of Philippines in seventh positiomn with 1713. Guam's Arron Elliot did well to take up eighth with 1700 while Hong Kong's Michael Mak needed a big game of 266 to leapfrog into ninth with 1690. 2017 Hong Kong Open champion, Ammar Tarrad of Saudi Arabia, GJ Buyco of BTA-Prima and Ivan Malig of Philippines made the cut for the next round in 10th to 12th positions respectively. Jonovan Neo of Singapore, who was in the top 12 most of the way, missed the cut 13 pins to finish 13th with 1666. Early pace-setter, Padawan fizzled off with three poor games to end in 17th. The top 12 finishers will be joined by the top 6 local and top 6 overseas seeded qualifiers for another 8 games in Round 2 finals starting from scratch and commencing at 2.00pm local time. The top 3 at the end of the Round 2 finals will proceed to the stepladder shootout finals.